DuraPaper is a leader in the paper void filling industry, we deliver innovative and sustainable packaging material. Our PAPER Void Filling System range includes a variety of paper packaging machines that deliver superior packaging material on-demand to help optimise your packaging process and ensuring optimum product protection. 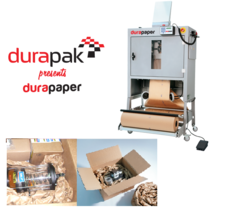 Durapak's kraft paper forms efficient and economical paper padding around your products during transportation and storage. Our kraft paper is versatile and offers users custom-fit protective packaging material that is easy to use and ideal for all in the box protective packaging applications. PAPER Void Filling system creates paper padding through paper packaging machines that have been developed with automation and Working Comfort in mind. A semi or fully automated paper packaging machine will improve ergonomics at the packaging station, increase warehouse efficiencies and help minimise costs. 1. Flexible Largest selection of in-the-box paper packaging products and machines in the industry. 2. Safe The unique compression technique means added volume - Paper void filling system cushions boast up to 30% more cushioning volume and higher compressive strength than other paper systems. 3. Easy Reliable easy-to-operate equipment with efficiencies like programmable keypads and hands-free foot pedal control. 4. Versatile Multiple machine configurations, flexible features and add-on components allow you to fit the equipment to your packaging process and engineer the most efficient production methods for your packing requirements. 5. Dependable Skilled responsive representatives and service technicians to ensure your packaging systems are operating at peak efficiency. 6. Paper can easily be recycled together with used corrugated, newspapers and other paper waste. The organic parts are biodegradable. We also offer paper with recycle content. 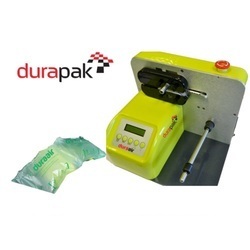 durapak does not use coated paper. Disposal into established recycle circuits helps to increase reduction of virgin raw material use. As a leader in air cushion packaging, our ranges of packaging systems have been designed to ensure high levels of product protection through its transit and storage life cycle. 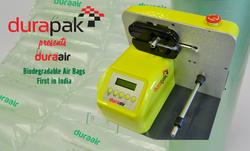 AIR Void Filling System air pillows provide a durable block and brace product and a reliable cushioning material for light to medium weight products. The lightweight properties of the air pillows reduce shipping costs and because the air cushions are produced on demand they require minimal storage space. Our ranges of void fill machines have been engineered to work for prolonged periods of time at high speeds and are amongst the most reliable in the industry. The AIR Void fill portfolio consists of three different packaging systems enabling us to offer you a tailor made solution to improve your packaging process and deliver our working comfort ethos. Wraps fragile products in AIR void fill Bubble air cushions ensures protection on all sides of the object. The products are padded and cannot be scratched. The on demand solution is an efficient alternative to conventional air pad film or pre-inflated bubble wrap. 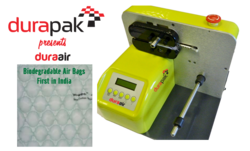 AIR void fill Bubble offers product protection at the push of a button. The smart tear off quality perforation lets you quickly tear the material off without looking for the perforation. One single section has a length of just 85 mm. This makes the protective packaging for small products significantly more material and volume efficient than the market standard of 250 mm. A compact device with the film roll replaces the large and cumbersome bubble wrap, saving both storage space and reducing the handling costs. Compared to conventional bubble wrap, AIR void fill Bubble also offers advantages for the end user. With one cut, the air escapes the air cushions, leaving only a small amount of film for disposal or recycling. The AIR void fill Bubble is one of the most low cost solutions on the market. AIR Void Fill cushion is the perfect solution for wrapping products. The pad strand is separated on the perforation between each film section for the desired length. The smaller or greater the contours of the object are, the more flexible the form of the pad strand must be. Because of this we offer variations in the number of air chambers per film section and the product can also be used for void fill and blocking & bracing. Looking for Protective Packaging Solution ?